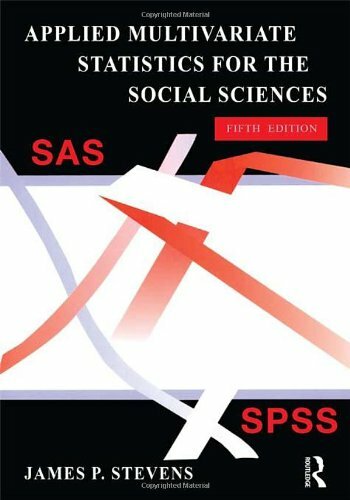 [PDF] Applied Multivariate Statistics for the Social Sciences, Fifth Edition | Free eBooks Download - EBOOKEE! Description: This best-selling text is written for those who use, rather than develop statistical methods. Dr. Stevens focuses on a conceptual understanding of the material rather than on proving results. Helpful narrative and numerous examples enhance understanding and a chapter on matrix algebra serves as a review. Annotated printouts from SPSS and SAS indicate what the numbers mean and encourage interpretation of the results. In addition to demonstrating how to use these packages, the author stresses the importance of checking the data, assessing the assumptions, and ensuring adequate sample size by providing guidelines so that the results can be generalized. The book is noted for its extensive applied coverage of MANOVA, its emphasis on statistical power, and numerous exercises including answers to half. The new edition features: New chapters on Hierarchical Linear Modeling (Ch. 15) and Structural Equation Modeling (Ch. 16) New exercises that feature recent journal articles to demonstrate the actual use of multiple regression (Ch. 3), MANOVA (Ch. 5), and repeated measures (Ch. 13) A new appendix on the analysis of correlated observations (Ch. 6) Expanded discussions on obtaining non-orthogonal contrasts in repeated measures designs with SPSS and how to make the identification of cell ID easier in log linear analysis in 4 or 5 way designs Updated versions of SPSS (15.0) and SAS (8.0) are used throughout the text and introduced in chapter 1 A book website with data sets and more. Ideal for courses on multivariate statistics found in psychology, education, sociology, and business departments, the book also appeals to practicing researchers with little or no training in multivariate methods. Prerequisites include a course on factorial ANOVA and covariance. Working knowledge of matrix algebra is not assumed. 2008-12-06Applied Multivariate Statistics for the Social Sciences, "Fourth Edition"
No comments for "[PDF] Applied Multivariate Statistics for the Social Sciences, Fifth Edition".